I had written something kind of like this in my journal a year or two ago. This is a revamp of it for a friend of mine (hi Rachel!) who wanted to see a comic strip that would make the point that "just because it's on the internet doesn't mean you can use it however you want" -- or in other words "intellectual property is still property". Selling your car was dumb. I'm no longer receiving large sums of cash because I can no longer hotwire your car to make my deliveries. I have not the time to form an exploratory committee to locate another sucker whose car I could use for this purpose. Poop. Purchase a late model Cadillac right away before I call my attorney regarding your responsibility to my business. Haha, a rage cartoon! Awesome. not signed in, oh noes! - Well that was a pretty great metaphor fer art-stealin'. Excellent work! 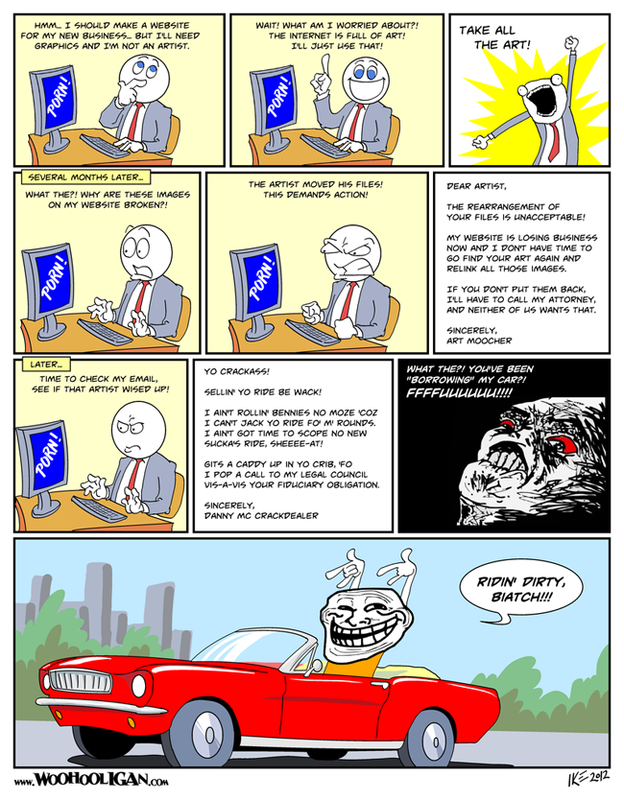 And you used rage comics without being completely insufferable! Amazing!